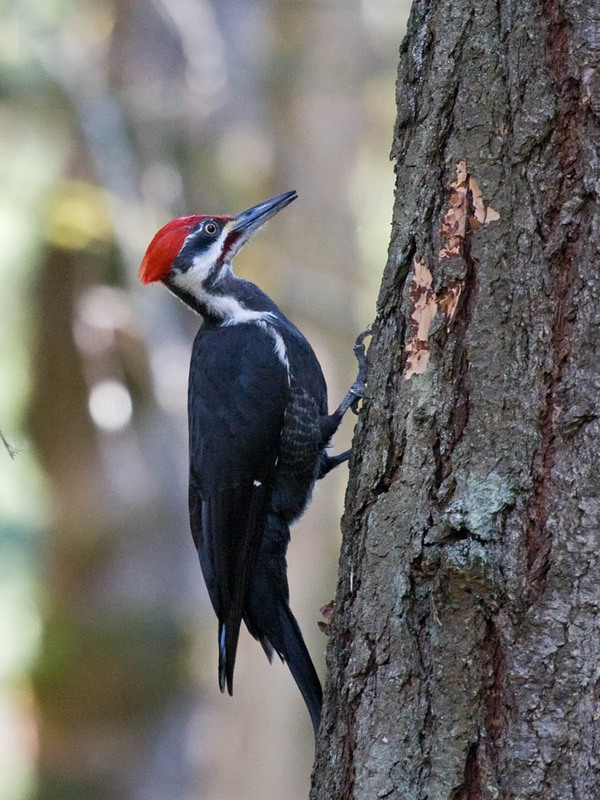 Pileated Woodpecker, February 4, 2012, Beaverton, Oregon, by the author. Like Chris Petrak last month on the Birding is Fun! blog (Chick-a-Dee-Dee-Dee), I usually deny having a favorite bird. I'm not sure why. Perhaps it is because from my earliest memories I wanted to grow up to become a scientist--logical, analytical, unencumbered by sentiment. Childish ideas, yes. But still, I find the mental challenge of observing and making difficult identifications a major draw of birding, not simply the joy of watching delightful living creatures. Of all the birds, I guess my favorite group is the woodpeckers. The morphology of woodpeckers is unique among birds. They are specially designed for their very interesting life habits and habitats. Chisel beaks, strong zygodactyl feet and sharp claws, stiff tails for propping themselves on a tree, a tongue and hyoid apparatus that wraps all the way around the head, a skull with special brain construction to allow pounding away all day without (presumably) getting a headache. And there is something about birds with crests (cardinals, waxwings, large woodpeckers) that is charismatic. So, if pressed, I might say that Pileated Woodpecker is my favorite bird. But that'd be a lie. If I had to give the reason why Pileated Woodpecker might be my favorite bird, I'm sure it has to do with drive-in movies. At one time, before CD's and Netflix, drive-in movies were a lot more popular than they are today. Each show began with a short cartoon. 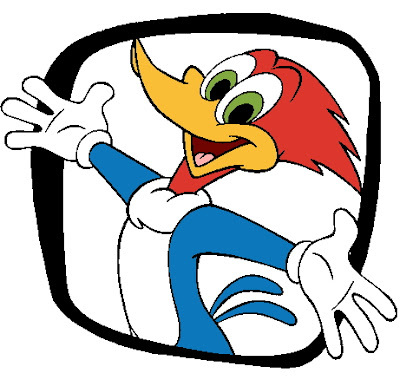 My favorite was Woody Woodpecker. Who could resist that mischievous, crested woodpecker? I always thought that Woody Woodpecker was based on the Pileated Woodpecker. But no. Think southern California. The brash, oddly-patterned woodpeckers there, drilling holes in everything wooden, are Acorn Woodpeckers. It's true! Woody Woodpecker is a mutant Acorn Woodpecker given a crest by Hollywood cartoonists. Woody's signature laugh even resembles the "wack-up! wack-up!" call of Acorn Woodpecker. "Guess who? Wha ha hahaha! Wha ha hahaha! Hahahahahahahaha!" 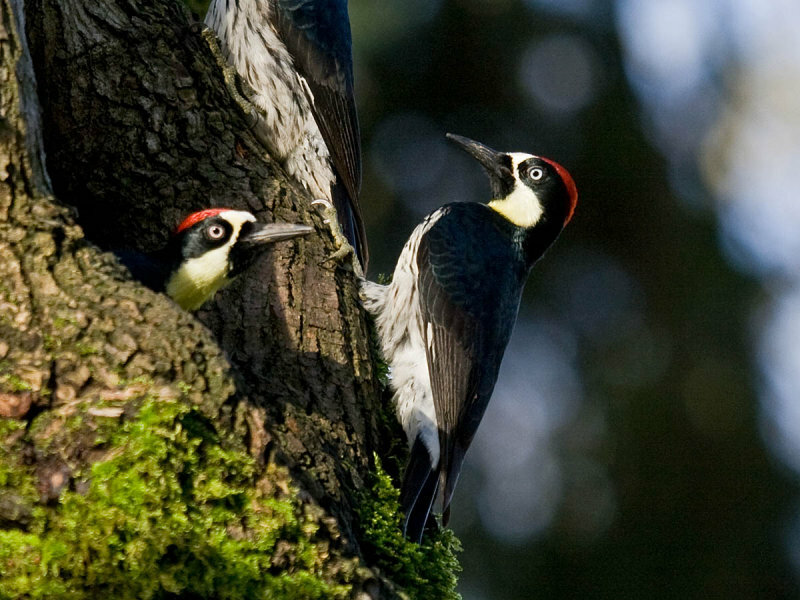 Acorn Woodpecker, January 10, 2010, Forest Grove, Oregon, by the author. Now you know the real reason why I don't admit to having a favorite bird! My favorite bird would be the Greater Sage Grouse. Endangered, but not endangered but oh what a wonderful display each spring. Wow, what a great bird. (My favourite is the Barn Owl). it is hard choosing a favorite bird. I seem to love them all. The Pileated and the Acorn woodies are great birds. Wonderful post and photos. No wonder non-birders think of us as crazy if they think of Woody, and Leghorn, and Tweety bird, and ... Haha! Yes, they are beautiful and fascinating, those woodpeckers, and noisy sometimes! My fav are the Kestrels. Great post Greg. The Pileated was my spark bird, so I love the group too. i'm a fan of the downy woodpecker. cute lil' buggers. I so enjoyed reading this fun, wonderful post! Your woodpecker images are fantastic! We have a few Pileated Woodpeckers living in the woods at the back of our property, but I have only caught glimpses of these interesting, elusive birds. It's difficult to select a favorite bird, but if I had to, Eastern Bluebirds are very near and dear to my heart.